We have built and facilitate a dynamic and vibrant network that campaigns for greater equality and democracy and nurtures progressive values across society. We work with as many parts of the labour movement as possible, to reach out to as many partners outside the traditional social democratic family. We are developing our regional activity, focusing on creating groups where they currently don’t exist and building capacity where they do. We aim to have 20 local groups by the end of the year and have already recruited several regional representatives to coordinate our activity at a local level. We have developed speaker pool to reach the hearts and minds of progressive students and young people. We lobby Compass MPs to take our campaigns to the heart of government and to act as a bridge to supporters in this country. 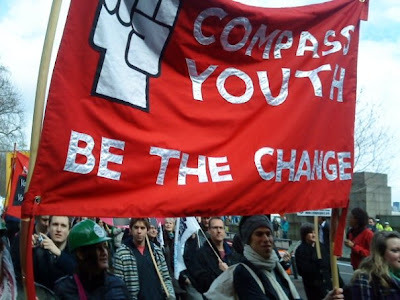 We also partner with progressive media, trade unions, community groups and socially responsible businesses, focusing on those in which Compass Youth members are already involved in. We have opened the debate in the Labour Party such as with the campaign for treasurer, selection for NEC Youth Rep, deputy leadership campaign and the selection campaign for Chuka Umuna. Unlock Democracy, New Local Government Network, Labour Movement for Europe, PES Activists, Save the Labour Party, European Alternatives, London MEPs, Diversity & Integration Network, Demos, TMP, Black Socialist Society, London Citizens, UNISON, Global Policy Institute, Community, Unite, Avaaz, CER, Involve, Fabian Society, NUS, Searchlight, One Voice, Unions 21, TUC, European Parliament, Spanish Socialist Youth, IUSY, CND, Oxfam, Désirs d’Avenir, PASOK, SERA and Liberty. We actively champion events and campaigns by Compass and our progressive partners. We also organise distinctive and exciting activities ourselves with Compass or autonomously. We have organised 10 debates over the last year as well as taking part in conferences and workshops by other progressive groups and campaigns for equalising the minimum wage, the living wage, two state solution, the NHS, against the anti missile system, civil liberties and votes for 16. We built a dynamic and vibrant coalition of progressive young people to help campaign for Ken Livingstone’s re-election as Mayor of London. We helped organise political integration initiatives to get out the vote of EU citizens in the London elections and played an active role in supporting the Hope not Hate and We’re all Londoners coalitions. We also supported the Choose Change road show for the deputy leadership campaign for Jon Cruddas. 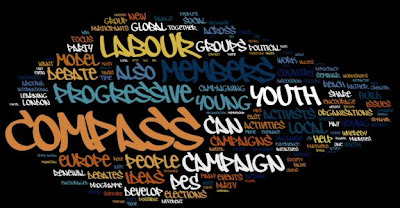 We have been developing a “progressive soulmates” network to shape the Your Space manifesto and campaign in general elections across Europe, building towards the European Parliament elections in 2009. We have engaged young “progressive expats” in the UK as the eyes and ears of their countries. 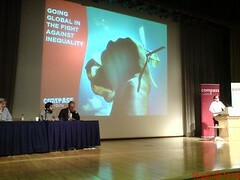 We organised a series of successful debates as part of the Your Space manifesto, organised campaign exchanges in France, Spain & US, facilitated workshops at the ECOSY Summer Camp and participated in youth leader delegations to Southern Africa and Greece. We want to build international campaigns on issues that cross borders through further campaign exchanges and summer academies.